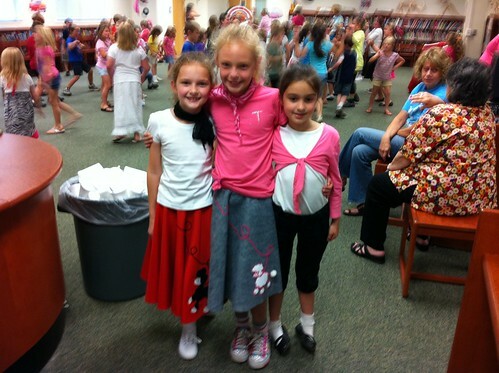 For the kids meeting their AR (I forget what the AR stands for; but it is a reading program) goal in school this fourth quarter they got to go to a sock hop at school. It happened to be the day of Anna’s birthday and since I was bringing cupcakes to her class I got to take a few photos of the sock hop. Just wanted to share. Sorry it is blurry, but I was taking photos with a phone with one hand and trying to hold on to Luke with the other hand. 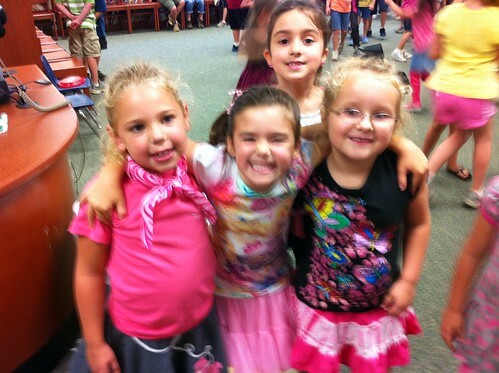 The first photo is Anna, with her friends Josie and Emerson (and Isabelle sneaking into the photo), and the second photo is Isabelle, with her friends Skylar and Jada.